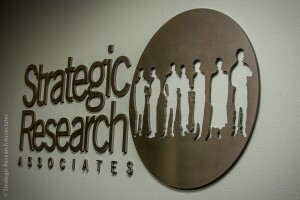 Whatever the objective – determining the right market target or position, the optimal product configuration, the right message, the most effective ad copy, the best customer satisfaction/retention approach, or the most effective litigation strategy – Strategic Research Associates can help you find your answers. The managers and research partners at Strategic Research Associates have a combined total of almost seventy years of professional market research experience. Survey Research: Expertise in questionnaire design, statistical analysis, and complex sampling issues brings value to the dollars you invest in research. Focus Groups and Mock Juries: Experienced moderators as well as friendly, dedicated hosts help ensure your project outcomes exceed your expectations. Experienced Staff: Our staff boasts over two decades of experience in the market research field. We take pride in presenting our clients with a detailed but easily understood set of reports that thoroughly address your objectives and lead you toward clairvoyant, actionable results. Our philosophy towards research is simple and straightforward: by leveraging research in a smart way, we can assist our clients in learning more about their customer and client populations, allowing them to make smart business decisions in the future. You will find that our research deliverables, research activities, methodologies, and customer service provide you with clear, accurate, actionable results that you can easily understand and put into practice. Strategic Research Associates is sought out by our region’s leading organizations when they are looking for research that has significant financial implications. Our clients have built multi-million dollar facilities, made major changes to products, and increased sales by simply implementing the findings in our research.